Even in first gear, 1. Minnesota and 2. Los Angeles look inevitable. Shifting the WNBA Playoff format may have been one of the best decisions the league has made in the last 10 years. Can the Lynx be the Warriors of the WNBA this season? Should they try? Sitting in the parking lot of Austell’s Riverside EPICenter, where his team practices, Dream coach Michael Cooper said there are two reasons why the WNBA squad is 5-1 and atop the Eastern Conference after finishing fifth and missing the playoffs last year. The first is an upgrade at center and at point guard. The second reason given by Cooper was chemistry. Leading scorer Angel McCoughtry referred to it as positivity after Sunday’s win over Chicago. 4. New York: Interesting comment from last night’s Seattle/NY broadcast – when leading by 7 last year, the Lib did. not. lose. That’s been an issue this year – the Storm’s comeback attempt is a case in point. Charles is on fire, and Sugar is smokin’, but the rest of the team is a question mark – do the show up (hello, Indiana game) or not? Much of the Lib’s future will depend on Prince’s ability to return (post Olympics?) to create a more consistent inside/outside balance. After a rough start to their season, the Chicago Sky are getting back on track. Last season, they compensated for a lackluster defense by outrunning and outgunning the competition, playing plenty of three-guard lineups with Elena Delle Donne at the 4. This year, things are a little different. 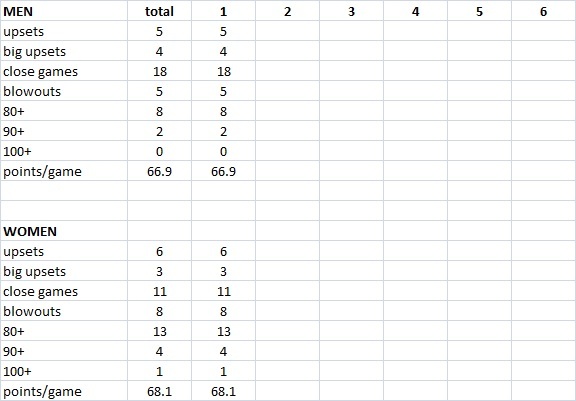 With their center position log-jammed, coach Pokey Chatman has had to figure out minutes distributions for her post players, which has led to larger lineups and a lack of continuity at the 5. Despite this, the Sky have retained their success on offense, and after starting 1-4, they’ve won their last three games to vault them back into playoff contention. 7. Dallas: Young and Gun. This early in their Texas career it’s important to win on their home court. Or, if they’re going to lose, lose with high scoring enthusiasm. Eventually, though, the word “defense” will have to enter their play.. ditto health. 8. Seattle: Not sure what to make of them, but the Stewie/Loyd pairing is sure sweet (sometimes). How quickly can Boucek mold old and new? On Friday, Breanna Stewart returns to Connecticut for the first time since leaving UConn just a few months ago. Ahead of the Storm’s meeting with the Sun (7 PM ET, WNBA League Pass), Breanna Stewart talked to reporters about adjusting to the WNBA, her partnership with Jewell Loyd, and what it will be like to return to Connecticut. 9. Washington: Bill’s early advice was to “get healthy.” They’re getting there (as their win over Atlanta showed). Will it hold? 10. San Antonio: I love Dan Hughes, but what on earth has he wrought? GM Ruth will have some reorganizing to do. Are Peters and Jefferson strong enough building blocks? 11. Phoenix – They look at sixes and sevens, with not-good rumors floating… NOT what the fans (or the GMs) expected, no? 12. Connecticut: Would love to talk to coach about his learning curve. The message on Friday from Connecticut Sun coach Curt Miller was pretty simple. If his players don’t want to put out the effort that he wants in the game plan that he has devised, than they just aren’t going to play for him. “Everyone in this league wants to play and you have to reward people when they are playing hard and when they are playing efficiently,” Miller said following the loss to Atlanta on Friday at the Mohegan Sun Arena. To the fans, please be patient. Rome wasn’t built in a day. SlamOnline: Go Ahead and Respect It How going to a WNBA game changed one man’s outlook on the women’s game. I’ll be honest with you: I wasn’t a fan of the WNBA growing up. I didn’t pay much attention to their games, even though I knew a few of their stars (Lisa Lesile, Sue Bird and Becky Hammon). Heck, I didn’t even watch those dominant, title-winning women teams at UConn. All because I thought watching women’s basketball, wasn’t a “cool” thing to do. Unfortunately, our counterparts receive a bad reputation for their game. You’ll hear offensive comments regarding their skills, looks and even sexuality. Despite having backing from the NBA and an aggressive public relations plan, the WNBA can often struggle to catch America’s attention. But something changed for me last Tuesday, as I covered the New York Liberty vs Atlanta Dream game at Madison Square Garden. On this week’s “Around The Rim,” women’s basketball analyst LaChina Robinson and this week’s special guest host former WNBA All-Star Chasity Melvin delve into the discussion of team chemistry. The two highlight how the Mercury are finally showing signs of gelling together, how the Lynx haven’t missed a beat this season, which rookies are shining in the first weeks and give their take on the first-ever WNBA AP rankings. Plus, they share their picks for the NBA Finals. As Breanna Stewart walks to center court for the tip-off at the Sweet 16 of the NCAA Women’s basketball tournament in Bridgeport, Connecticut, a murmured buzz runs through the crowd that’s seated courtside. But it’s not for Stewart, the most recognizable name in the women’s college game, or even for UConn, the mecca of women’s college basketball. “It’s Holly Rowe,” someone says over my shoulder, pointing toward the court. Sure enough, Rowe glides past in a navy blue dress and heels, smiling to the fans who shout her name and stopping to shake hands or hug those who extend a greeting. Throughout the game, Rowe, a longtime ESPN sideline reporter, hustles from one bench to the next and works her way up and down the sideline, stopping only briefly to review notes or chat with the occasional fellow member of press row before dashing off to cover the next on-air moment. As Azura Stevens was emerging as a college prospect at Cary High in North Carolina, analyst Debbie Antonelli took special interest. Stevens, after all, was playing for Antonelli’s alma mater. Before playing for Kay Yow at North Carolina State, Antonelli — then Debbie Mulligan — played basketball at Cary High. So Antonelli has a history with Stevens, who recently transferred from Duke to UConn. And as an analyst for many ACC games, Antonelli has watched Stevens develop during her first two years of college. Her scouting report for UConn fans? In this wide-ranging conversation with The Oregonian/OregonLive, Rueck reflects on the memorable season and looks ahead to what’s next for the Beavers. It’s officially June. Have you finally had a chance to really step back and reflect on everything that happened this past season? From time to time, because it comes up so much with people. There’s obviously been a lot of conversation about it. I don’t know if you step back and look at the whole picture, really. I don’t know when that will happen, necessarily. But just the specific moments that come up have been fun to go back and look at. I’ve watched our highlight video a few times. That was really well-done and that brings back vivid memories. There’s a lot of reliving the Baylor game with all of us. That’s the one that tends to come up the most. It was an amazing thing to be a part of. Dumping high expectations on a team certainly doesn’t make playing any less stressful. That was the reality Ohio struggled with all last season, a year removed from an NCAA Tournament appearance, with a returning roster that could produce the best result in program history. Yes, there was pressure. At times, that led to visible stress. On the right wall in Courtney Banghart’s office is a framed article: Fortune Magazine’s 50 Greatest Leaders from 2015. There, her name and accomplishments are listed alongside people such as Apple CEO Tim Cook, Tesla and SpaceX CEO Elon Musk and Uber CEO Travis Kalanick. Banghart’s lead of the Princeton women’s basketball team to a 30-0 regular season, and the first NCAA win in the program’s history, earned her a continuous spotlight all season long. As a leader in the national spotlight, her abilities to guide her team are tested night in and night out. But this upcoming season could be one of the most unpredictable for her in many seasons. She is forced to handle not just a drastically changing roster but also a league continuously growing and evolving. After four years playing in a refurbished Foster Auditorium, Alabama women’s basketball is moving back a few blocks to Coleman Coliseum. The school announced the move Tuesday morning as coach Kristi Curry expressed her desire to create an electric game-day atmosphere. Foster Auditorium holds 3,800 while Coleman Coliseum seats more than 15,000. The second person Nancy Lieberman called after she got the assistant coaching job with the Sacramento Kings was Muhammad Ali. She shared her first memory of seeing ‘The Greatest’ at the age of 10. “Late 60’s early 70’s, you know, people were telling me, you know, I’m stupid, I’m dumb, I’m never going to make anything of myself, girls don’t play sports and I saw this man on T.V. you know, defying the odds and saying he was the greatest of all time,” said Lieberman. It wasn’t until she was 19 or 20 years old when she met him. The Australian women’s basketball team have received a taste of what to expect at the Rio Olympics in a 58-55 loss to Spain before Spanish fans. After smashing Argentina by 42 points in the first game of their European tour a day earlier, the world No.2 Opals had a much tougher task against world No.3 Spain in San Fernando on Tuesday morning (AEST). A top U.S. coach is in the Gaza Strip to help set up the territory’s first female wheelchair basketball team. Markt, 40, was a track athlete until 21 years ago when he suffered a severed spinal cord in a car accident. Three years later, he began playing basketball and in recent years he has coached wheelchair teams in Afghanistan, India and Cambodia. Today the Women’s Sports Foundation released, “Beyond X’s & O’s: Gender Bias and Coaches of Women’s College sports,” the first study to measure the issue of gender bias in coaching of women’s college sports on a systemic basis. The findings confirm that there is a systemic gender bias directed at female coaches of women’s sports; it is not sporadic or limited to a few institutions. As a result, women face limitations in pay and professional advancement in the coaching workplace. And it’s a trend showing no signs of improvement. It begins, as everything does, with my mother. Schizophrenic and eventually unable to care for her children, my mother vacillated wildly between affection, praise, bouts of intense creativity and joy and seemingly infinite rounds of melancholy, listlessness and abuse. Living with a mother whose mental illness made her behavior erratic and her presence unreliable made me an expert at reading other women, at shaping my needs, desires, and self to fit their moods. As I move into grown womanhood, I’m shedding this tendency toward accommodation and emotional acrobatics that put other people’s (lovers, friends, colleagues) needs before my own. I get it wrong sometimes, as humans do, but we make the road by walking. Baylor’s former president and chancellor Ken Starr sat with ESPN’s Joe Schad for a televised interview after a Pepper Hamilton report alleged systematic disenfranchisement of students who reported being sexually assaulted by other students, including some players on the football team. Starr called for transparency and simultaneously hid behind his “veil of ignorance,” a garment that can be found next to the cloaks of deniability in Aisle 5. It’s a gutsy move, calling for others to be forthright when you can’t lead by example. Starr was evasive throughout the interview, even on a question about how Baylor handled the assault claims. SO….. what do you think the folks who gave the video below a thumbs down were thinking? but the folks battling it out for the WNIT post-season championship are hanging out at the Charleston Civic Center, WV. West Virginia over Temple, 66-58 (OT). The story book post-season run for the Temple women’s basketball team came to an end in the WNIT semifinals on Wednesday, as the Owls fell to West Virginia, 66-58, in overtime. Temple closes the 2014-15 campaign with a 20-17 overall mark. It’s not been an easy ride for the Mountaineers. a month ago Carey refused to let the team practice in West Virginia gear because he was so upset with their effort and passion for the game. “We had people who didn’t care if we won or lost. We had people that weren’t playing hard and we had people, in my opinion, that didn’t care about the state of West Virginia or West Virginia University,” said Carey. The West Virginia will host UCLA, who defeated Michigan, 69-64, in Michigan. The entire second frame was a tense, back-and-forth affair. Trading baskets, neither team was able to find separation for the bulk of the half. But with UCLA just one step quicker, Michigan couldn’t extend its season. When UCLA and West Virginia square off Saturday for the WNIT Championship (3 p.m. ET, CBS Sports Network), each team has already banked the kind of insight that can only come from games played under pressure. For the Bruins (18-18) and their roster of 10 new players, the tournament has been almost reassuring – the stress and hard days of learning how to survive a Division-I campaign are more in the background, and now the team plays with confidence and a real sense of purpose about the future. A list of Final Four events in Tampa. By the time they’re through at Maryland, they all emerge into their own players. But on a team loaded with players whose parents competed in sports either professionally or collegiately, the Maryland women’s basketball team benefits plenty from its cadre of second-generation stars, led by point guard Lexie Brown, daughter of former NBA star Dee Brown. Laurin Mincy’s final practice in College Park as a member of the Marylandwomen’s basketball team took place at Xfinity Center’s auxiliary gym rather than the main court. Not exactly an ideal way for the redshirt senior to bid farewell to the arena where she spent five seasons forging a career notable for perseverance and revival. A high school robotics convention had forced the Final Four-bound Terrapins to their secondary practice facility Thursday afternoon, but for Mincy, the minor inconvenience wasn’t about to spoil another opportunity to be with her teammates. At 5-foot-7, the skinny and well-mannered Jefferson does not look like a typical star athlete. Still, she is one of the nation’s quickest players and one of the most valuable members on a team filled with former high school all-Americans. A junior, she averages 12.3 points a game, leads UConn with 4.9 assists and 2.5 steals a game and shoots 59.5 percent from the floor and 50.5 percent on 3-pointers. She was named a second-team Associated Press all-American this week. Notre Dame isn’t planning business as usual this Final Four. Coach Muffet McGraw realized after the Fighting Irish clinched the Atlantic Coast Conference regular season title for a second straight season that the team didn’t seem to celebrate much. Then it happened again when they won the ACC tournament. ”They were excited, but then I watch other teams and they’re jumping all over the place,” she said. ND Insider: Does Notre Dame have the size to win it all? They do get pink sneakers. Staley was speaking of the Gamecocks’ semifinal win against LSU, where Mitchell was 1-of-6 for four points and had five turnovers. Yet, USC won by 20. “We’ve been playing in situations all year long where we were in the driver’s seat,” USC coach Dawn Staley said. “I think that’s no longer the case. In the Final Four, we’ll go back, probably, to being the underdogs because we’re the new kids on the block. Cheryl Mitchell wasn’t sure what project her third-grade daughter was working on when she asked to go to the store to pick up poster board. Tiffany Mitchell created a collage of WNBA star Dawn Staley, beginning a trek that’s landed the South Carolina coach and the Gamecocks’ standout in the school’s first Final Four. She scored the go-ahead basket to beat North Carolina, 67-65, in the Sweet 16, then followed that with seven consecutive points to put the Gamecocks ahead for good in an 80-74 victory over Florida State in the Elite Eight. Now the All-American and the rest of the Gamecocks (34-2) will square off against Notre Dame (35-2) in the national semifinals Sunday night in Tampa, Florida. He isn’t talking about playing basketball the “right” way or whatever, he’s talking purely about entertainment. He’s right: college basketball this year hasn’t been entertaining to watch. It hasn’t. Scoring is down, and like it or not, most Americans like sports where people can score. Every other major sport in the world has taken steps to help people be better on the offensive end of the floor. They’ve moved in the fences in baseball, they lowered the mound. They made the strike zone so you need a straw to put through it. And in the NFL you touch a guy it’s a penalty. You hit the quarterback, you’re out for life. You know, in the NBA, you touch somebody in the perimeter, you whack guys like they used to do when scores were 90 to 75, they changed the rules. Again, Auriemma is right. Every other American league has worked to improve scoring, and to make the game more enjoyable for fans. “I’ve got to tell you, I’ve always been fascinated by people who care so much about what other people are and what they do in their personal lives,” he said. “Like, how small-minded do you have to be to care that much about what other people are doing? Life is hard enough trying to live your own life. What do you care about what other people are doing if it doesn’t affect you. “And hiding behind this religious crap? That’s just the most cowardly thing that I’ve ever heard. The NCAA Final Four is scheduled for Lucas Oil Stadium this weekend in this state capital. But college basketball’s biggest celebration likely will be disturbed by a series of protests over a new Indiana religious freedom restoration law that critics say could allow businesses to turn away gay and lesbian customers in the name of religious freedom and open the door for legalized discrimination. Bigotry is apparently alive and well here in the heartland. I thought this ship had sailed with the passing of the civil rights laws in 1965. THE drama in Indiana last week and the larger debate over so-called “religious freedom” laws in other states portray homosexuality and devout Christianity as forces in fierce collision. But in the end, the continued view of gays, lesbians and bisexuals as sinners is a decision. It’s a choice. Big corporations like Walmart, Apple, Salesforce.com and General Electric and their executives have done the right thing by calling on officials in Indiana and Arkansas to reject “religious freedom” laws designed to give businesses and religious groups legal cover should they deny service to gay couples. But the business response to these laws raises a larger issue about the role companies play in the political process. If corporate leaders are serious in opposing discrimination, they should refuse to finance the campaigns of lawmakers who want to deny civil rights to gays and other minority groups. The men’s Final Four is in Indianapolis this weekend and could not have been moved on short notice. But officials have made it clear there is enough time to consider relocating future events, and that they want an environment welcoming to all athletes and fans. ”What’s going on in Indiana is troubling,” NCAA vice president of women’s basketball championships Anucha Browne said Wednesday. Angel McCoughtry, the star forward for the WNBA’s Atlanta Dream and an Olympic Gold medalist, came out as gay through her Instagram account on Tuesday after an apparent dispute with the Turkish team she played for during the U.S. off-season..
Few doubt Butler’s work ethic, or her passion for Gator basketball that dates back to when she was a point guard at UF under Carol Ross from 1990-94. But her eight-year tenure at Florida has produced mixed results. Butler’s 153 wins are second-most in school history, and she’s averaged 19 wins per season at UF. She’s led the Gators to three NCAA Tournament appearances in eight seasons, but never past the second round, and her career NCAA Tournament record is 3-3. Her career SEC record is 56-68. The 2014-15 season had its share of highs and lows for the Nebraska women’s basketball team. When the team capped off a 7-0 start to the season with a home victory against No. 9 Duke before a raucous Husker crowd on Dec. 3, it seemed to be the sort of tone-setting win that would carry over to the rest of the season. Instead, the win didn’t even carry over to the next game, as the Huskers fell on the road to a sub-par Alabama team that would go on to post a 2-14 conference record in the SEC. This wild swing of performance and fortune seemed to define the rest of the season for a Nebraska team that struggled with injuries from start to finish. Indiana: A Look Back: Indiana State Women’s Basketball – Meghan McKeown sat down with head coach Joey Wells to talk about the season. Senior guard Blake Dietrick, however, commented on a different side of the team: a group of women hungry to win after not qualifying for the tournament last season. Even with this extra motivation, the level of success this team achieved was surreal even to them. Stanford: Was this a rebuilding year for women’s basketball? Despite the Cardinal losing winnable games this year and not playing like one of the best teams in the nation at times, this was not a rebuilding year. The Cardinal lost one elite player last year in Ogwumike and another key player in Mikaela Ruef. Losing only two starters didn’t mean that the team needed to be rebuilt — reshaped a bit, perhaps, but not rebuilt. The Cardinal made it just as far this year as they did two years ago despite the absence of Ogwumike, muffling the gossip swirling that the team wasn’t living up to the Stanford women’s basketball brand of recent years. Coming off the program’s worst season in 31 years and a fan base which has become restless, Daniels voiced his full support for coach Sharon Versyp and the coaching staff. One by one, they came to Brian Giorgis. “You’re in shock with each one,” the Marist College women’s basketball coach said, after the school announced four Red Foxes, including all-league forward Madeline Blais, would be transferring following the spring semester. The exodus places a program that has reached the NCAA tournament in 10 of the last 12 seasons in a precarious position, “beating the bushes” to fill out a roster that currently will have eight scholarship players and 10 total next season. Steve Lucius always appreciated the little things in life: the closeness of a small town, the grass-roots work ethic of middle America, the competitive intensity of backyard rivalries and some of the best barbecued ribs he ever sank his teeth into. All of those little things added up to one huge career for Lucius, who announced on Tuesday that he was stepping down as New Riegel’s girls basketball coach after 30 years running the program. “I grew up on those ribs,” said Lucius, a 1970 New Riegel graduate. And a lot of young girls grew up on New Riegel basketball as Lucius built the Blue Jackets into one of the top small-school programs in the state. One of the state’s most successful girls basketball coaches has decided to make a change. Carl Albert coach Tim Price officially resigned last week, bringing to end a very successful tenure with the Titans that included 10 state tournament appearances in his 11 seasons. It has been a little over a month since former MTSU star Cheyenne Parker was dismissed from the Lady Raiders basketball team for multiple failed drug tests. Despite her removal from the Blue Raiders on Feb. 27, Parker still plans to complete her mission of making a WNBA roster. Parker has been going through an intense workout program with a focus on heavy lifting, cardio and skill training. The main objective of Parker’s arduous workout regime: impress WNBA coaches and scouts on April 4 at the ProHoops WNBA Combine in Tampa, Florida. Imagine a woman covered head to toe in a loose fitting black robe (Abaya) with her head covered by a hijab so the only part of her body that you can see is that by which she is looking back at you . . . her eyes. It is against the law for her to drive. She cannot travel by herself without the consent of a male relative. Almost every public place is segregated, with one door for women/families and one for men. Marriages are often arranged on her behalf. Her only knowledge of sports is that by which she sees on T.V. or on the internet because there are no opportunities for her to partake as a spectator, let alone as a competitor. This image is representative of what we know of Saudi Arabian women. While I agree that a picture is worth a thousand words, I want to share with you some of the stories beyond that image that we so often evoke. I want to share stories of the girls and women that I met in my recent Sports and Women’s Empowerment Envoy with the State Department and the NBA/WNBA throughout The Kingdom. Becky Bonner and I went from the conservative capital of Riyadh to Dammam and finished our trip in the more liberal city of Jeddah conducting clinics with elementary to college-age players, as well as meeting with some amazing groups of women. The film, titled “Mind Game,” will also capture Holdsclaw’s recovery as she speaks out openly about the disorder that almost killed her, shedding light on mental illness and helping to open up conversation on the subject. Under an enormous amount of scrutiny – both by the Secret Service and by grumpy Committee bashers – the #8 Tigers and #9 Phoenix put together a nice game. Princeton dominated the boards and nailed their free throws to secure their first NCAA tourney win. Courtney Banghart had seen it once too often. It was not much more than a year ago and one more time than she could stomach watching Annie Tarakchian, then a sophomore, catch the ball in good position near the basket, hold the ball over her head and look to pass without ever showing the slightest inclination to propel a strong frame to the basket. So when Tarakchian was passive one too many times in practice before a key road trip to Harvard and Dartmouth a season ago, Princeton already in a hole in the Ivy League race by then, Banghart whistled proceedings to a halt and delivered a simple rebuke. It wasn’t just the Tigers who were roaring. If you recall, Susie McConnell-Serio’s team opened the season rather inauspiciously. That’s all forgotten as #10 Pitt Panthers produced a HUGE win for the program as they upset #7 Chattanooga, 51-40. “Walking up to hal court at the end of the game I said to him, ‘This is bittersweet,’ because I have so much respect for him,” she said. “I think he is one of the best coaches in the game, and I’m so happy that he’s still coaching because he just has so much to offer to his players. It’s fly like an Eagle time, as #7 FGCU defeats #10 Oklahoma State, 75-67. They move into the second round for the first time in program history. Smesko said the men’s team’s run two years ago has been “fantastic” bringing recognition for the school, located on the outskirts of Fort Myers, in southwest Florida. #13 Liberty has been a hard-nosed program for a while – as #4 North Carolina quickly re-discovered – but the Tar Heels pulled out the win. Latifah Coleman and Allisha Gray weren’t going to let Sylvia Hatchell’s return to the NCAA Tournament end so soon. Gray scored 17 points and Coleman had 15 to lead North Carolina past Liberty 71-65 on Saturday in the first round of the Greensboro Region. The fourth-seeded Tar Heels (25-8) shot 49 percent, led by 14 and withstood the Flames’ late push to give their Hall of Fame coach a victory in her return to the NCAA Tournament after a year away to fight leukemia. Taking lessons from their football team, #15 Boise State was not intimidated by #2 Tennessee – even on their home court. In the end, the Vols escaped the Broncos. The Lady Vols were clinging to a 63-58 lead after Boise State’s Camille Redmon made the front end of a one-and-one with 2:51 remaining. But Redmon missed her second free throw, and Tennessee’s Ariel Massengale sank a 3-pointer 13 seconds later to spark a game-clinching 8-0 run. Coach Trakh can be proud of the effort of his #16 New Mexico State team against host, and #1 seed, Maryland. The Terps ruled the Aggies, 75-57. Maryland center Brionna Jones could only giggle at the comparison. “Like PT boats attacking a battleship,” New Mexico State coach Mark Trakh said in describing the destruction the 6-foot-3 Jones inflicted on his shorter, slighter players as top-seeded Maryland won its NCAA tournament opener Saturday. All season, the Terps have won by continually switching guises. As if to prove that versatility, they beat New Mexico State with a bruising inside attack in the first half and a barrage of jumpers in the second. #12 James Madison and #5 Ohio State gave us the Debbie Antonelli Special, with the Buckeyes emerging victorious, 90-80. The Buckeyes — who started three freshmen and bring sophomore Shayla Cooper off the bench — shot 58 percent in the second half and scored on seven consecutive possessions down the stretch. #12 Quinnipiac and #5 Oklahoma gave us the second DAS, combining for 97 points in the first half and 99 in the second. Sooners scored more, so they win and move into the next round. When the Sooners were 5-5 in non-conference play earlier this season, it was tough imagining them making the NCAA Tourament, much less imagining them winning a game in it. But after finishing in second place in the Big 12, Oklahoma came ready to play in the NCAA Tournament. Their 111 points against Quinnipiac showed that despite their lack of experience you should never count out a Sherri Coale coached basketball team. Sun Belt champ Arkansas-Little Rock battled #6 Texas A&M wire-to-wire, then the #11 seed made good on the upset, 69-60, earning coach Joe Foley his 700th win. Taylor Gault scored a season-high 25 points, Kiera Clark added a career-best 22 and 11th-seed UALR beat sixth-seeded Texas A&M in an opening-round game Saturday. “The thought I had was to shoot and drive and do whatever I knew I could do best for my team,” Gault said. #3 Louisville tamed #14 BYU, but the game may be remembered for this action by the Cardinals’ Mariya Moore than the actual score. Meanwhile, Louisville’s inside presence out-muscled the Cougars from the opening tip. The Cardinals outscored BYU 44-30 in the paint, and added 11 second-chance points on 33 rebounds to net the win. Barely two minutes into the second half, Louisville’s Mariya Moore drew a technical foul — and the ire of both coaches — leveling BYU’s Morrison with a hard push off a screen. BYU leading scorer Lexi Eaton responded to the physical play of the game with an elbow of her own two minutes later, a move that went uncalled by the officials — though she did receive a foul on a push on the same play. #2 Florida State was in their comfort zone, and easily handled #15 Alabama State, 91-49. Alabama State was composed early but wore out, committing 32 turnovers against a stifling Seminoles defense. #14 Ohio spotted #3 Arizona State 16 points in the first half, but the MAC played the PAC even in the second. Nice re-focuser for the Sun Devils. Junior guard Elisha Davis increased the lead on the next possession, getting a steal and making the layup. In a 54-second span, ASU had gone on a 7-0 run. ASU head coach Charli Turner Thorne said the spurt was a result of ASU’s defense. “When our defense is turning people over and we’re getting easy buckets in transition, that’s when we’re at our best,” she said. Ohio coach Bob Boldon gave credit to that aspect of ASU’s game. Speaking of “re-focusers” #16 Cal State Northridge sure as heck provided that for Stanford as what seemed like a blowout-in-the-making turned into a dogfight. Cardinal escaped, 73-60. How many hard lessons is this year’s Stanford women’s basketball team going to have to learn? The Cardinal have already learned that beating Connecticut doesn’t mean you can’t lose to Chattanooga, that knocking off Oregon State doesn’t mean you can beat Oregon, that winning Pac-12 titles isn’t a default status, that changing your entire offense and turning it into a well-oiled machine isn’t going to happen overnight. And that hosting an NCAA tournament game isn’t the same as winning it. At least not if you don’t play well. Stanford figured that last one out just in time Saturday. South Florida made the most of its first home NCAA postseason game. Courtney Williams had 17 points and 12 rebounds, Alisia Jenkins added 15 points and No. 6 seed South Florida beat 11th-seed LSU 73-64 in an NCAA tournament first-round game Saturday night. The announced crowd of 5,560 erupted as the final seconds ticked off. The Old Big East fans were having serious flashbacks in Storrs as they watched #8 Rutgers and #9 Seton Hall go after it in OBE style. One year after staging a double-overtime thriller in the third round of the WNIT, Rutgers and Seton Hall turned in another memorable affair. For the second straight year in the postseason — and for the 34th time in 41 meetings all-time — the Scarlet Knights prevailed. When Sarah Benedetti moved to Canton, Conn., as a fifth grader in 2004, she almost immediately started rooting for the University of Connecticut’s basketball teams. That year, UConn became the first Division I university to win the national titles in men’s and women’s basketball. Benedetti began attending Huskies games with her family and teammates. She idolized the UConn stars Diana Taurasi and Maya Moore. She was so obsessed with the sport that she arrived at Canton High School at 6 a.m. each day to shoot for an hour before classes started. Her father, Sergio, rebounded the ball for her. Now a senior at St. Francis of Brooklyn, Benedetti competed Saturday night against her former favorite team. They were smiling from the moment they took the floor, especially when UConn’s starters were being introduced. This was their moment. And Benedetti, with a large cheering section on the day that her old high school lost its bid for a Class S state championship, did her best, making three three-pointers in a first half in which the team’s hole progressively grew deeper. She scored 13 points. 1. ACC flies high: In two days, the ACC went from filling one eighth of the field to representing one quarter of it. While other teams are disappearing, everyone from the ACC remains present and accounted for. No one in the conference has lost, and the league is 8-0 after another four-win day Saturday. Pittsburgh, Florida State, North Carolina and Louisville all cruised into the second round. The Tar Heels had to withstand a late push by Liberty, but otherwise, the games were not only wins but also comfortable ones. Even Pittsburgh, a No. 10 seed, thoroughly controlled Chattanooga from start to finish in handing the Lady Mocs their eighth straight tournament loss. For the second straight year, Chattanooga had a 25-game win streak snapped in the first round of the tournament. Panthers freshman Stasha Carey’s 16 points and 13 rebounds were just the second double-double in Pittsburgh NCAA tournament history. Now hurry up and turn on the TV! Note that this does not include the men’s play-in games. This is round of 64 vs round of 64. (inspired by this past season, and a brief twitter exchange with @ladyswish) Some names to jot down when you’re pondering your next women’s basketball coach – be it for next year, or in three years. And, as I read some of these bios, it simply reinforces the connection between point guards and coaching. Katie Abrahamson-Henderson – Albany. She’s only been there for 5 years, and accomplished a ton! Four straight league titles, anyone? Jody Adams – Wichita State. Coach Adams, now in her 7th year, has transformed the program. When when she took over in 2008, the Shockers had recorded 11 wins in the previous seaon. WSU just won their third MVC conference title in a row and, with a team so young, it’s hard not to imagine there’s not more success in their future. Jennifer Azzi – San Francisco. The revival of the Dons has been well chronicled at the WHB. Don’t know if Azzi would be interested in attempting to “rebuild” another program. I’m sure her current gig has been exhausting. But, a program that’s settle and needs a spark? Maybe. Cedric Baker – Savannah State. It’s been a long 12 seasons, but they won their first MEAC title this year. Courtney Banghart – Princeton. She’s young. She’s smart. She just went undefeated and has earned her program a ton of attention. Who knows if she wants to leave the Ivy, but wow, what potential. Laura Beeman – Hawai’i – The Wahine was a hot mess. Now, after three year’s of Beeman, not so much. Bob Boldon – Ohio. First the Penguins. Then the Bobcats. Bob is a builder. Anthony Bozzella – Seton Hall. Wherever he goes – LIU, Iona, Seton Hall – he turns programs around. Kenny Brooks – James Madison University. In his 13th year, all he does is coach teams that win. They just earned their fourth CAA title in six years. Michelle Clark-Heard – Western Kentucky. The ‘toppers just won the C-USA conference title and this year marked the first time WKU has been ranked in 17 years. Shouldn’t be a surprise, considering that, in her first year Clark-Heard helped WKU to a 13-win improvement over the 2011-12 season output. It was the largest in Sun Belt Conference history, as WKU turned a 9-21 mark into a 22-11 record. Brittney Ezell – East Tennessee State University. In only her second year at the program, ETSU was picked for a bottom finish in a conference preseason poll. Instead, the Lady Bucs finished second to UT-Chattanooga and scared the you-know-what out of Mocs in the So-Con tourney. Tricia Fabrini – Quinnipiac. Since the Bobcats moved up into the Division I ranks, they’ve shown they belonged – be it in the NEC or the MAAC. It’s been a 20 year journey, but maybe she could be tempted by another position? As Donna Finnie begins her second year as head coach in 2014-15, the HBU women’s basketball program looks to soar to new heights after a record-breaking inaugural season in the Southland Conference. In Finnie’s first year at the helm of the program, the team made huge strides both on and off the court. The Huskies won 12 games, the most since HBU began the transition to NCAA Division I in 2007. The Huskies also boasted the highest RPI in program history (251); a significant improvement from the 2012-13 campaign. Offensively the team exploded to produce one of the most efficient scoring attacks in the nation. On this year, from WHB: The Huskies (15-17) were the 8th seed in the Southland and yet made it to the finals. Cindy Fisher – San Diego. In her 10 year tenure, Fisher has moved the Toreros into the “often win” column. Megan Gebbia – American. In only her second year, Gebbia took her team to their first Patriot League Championship. Kellie Jolly Harper – Missouri State. Seems to me Harper was the sacrificial “next coach” at North Carolina State. She handled a no-win situation with grace, but couldn’t move the program forward. She’s having better fortunes at Missouri State, where she’s revivng the profile of a program that sailed to the stratosphere behind Jackie Stiles. Yvonne Sanchez – New Mexico. She’s rebuilt a program that fell rather precipitously after coach Flanagan retired. Her first few years were not particularly encouraging, but this year has been different – even after she had to dismiss the team’s captain and center. The Mountain West predicted UNM to finish ninth in the conference, after finishing in ninth place a year ago, but they made it to the conference finals. She has not gotten a contract extension (yet). Folks I spoke to while I was in Albuquerque said the admin wanted more butts in the seats. Karl Smesko – Florida Gulf Coast. Since joining Division I, all the Eagles have done is terrorize the A-Sun. Brooke and Scott Stoehr – Northwestern State. Hired in 2012 to revive the Demons’ program that had won just six games the year before, the Stoehrs have done just that. The Demons just won the conference tournament title and earned their fourth NCAA Tournament appearance in the school’s history. Jonathan Tsipis – George Washington. – In 2012, Tsipis took over a program that had won 25 wins over three seasons. WHB’s has been tracking the return of the Colonials to the top-25 all season long. Kevin McMillan – Tennessee Martin – Six years ago, McMillan inheirited a team that went 2-27. Now, the Skyhawks have repeatedly ruled the roost in the OVC. Amy Williams – South Dakota. Not easy to win in the Summitt, with in-state rival ‘wabbits lurking, but she has. Ryun Williams – Colorado State. Left South Dakota and, in three years, has turned around a Colorado State program that had a decade of poor results. The #1 seed in the Mountain West was upset in the conference tourney, but I expect they’ll be back. I’m sure there are plenty of other folks out there, ready to move up, including assistants that I know nothing about…. So, who else would you put on this list? womenshoopsblog @ gmail.com. About an hour before the start of an afternoon practice last week, Kaneisha Atwater shot dozens of 3-pointers as a wall-mounted computer called the Noah Instant calculated the trajectory of each attempt. The Noah, as the machine is known around Alico Arena, has become a rudimentary part of life for the women’s basketball team at Florida Gulf Coast University. The Eagles love to shoot 3-pointers — few teams in the country make more — and they spend hours trying to perfect the craft. Courtney Banghart, the women’s basketball coach at Princeton, believes one pivotal defeat has put the Tigers on the cusp of a historic regular season. Still, she thinks the Tigers grew immensely from that setback, which became a rallying point. Apparently CBSports will be broadcasting the 5pm game. I’ll be taking Amtrak down to Philly for my first trip to the Palestra. Texas Southern imposed its own penalty on the women’s basketball team, withdrawing from the Southwestern Athletic Conference tournament that begins Wednesday. That move Monday night came hours before the conference handed out suspensions for 15 players involved in the bench-clearing fight between the Lady Tigers and Southern on Saturday night. It’s believed to be one of the biggest number of suspensions in NCAA women’s basketball history. Kindred came out firing on Saturday night. Still, it couldn’t be sustained against the well-oiled machine that is the Minot Ryan girls basketball team. The Lions made their move late in the first half, eventually securing their third consecutive Class B state championship with a 68-52 victory at the Minot State Dome. Ryan (26-1) joins Bottineau as the only programs to win three straight. Last spring, Romero became a cause célèbre in the debate about student-athlete rights, athletic department power and politics, and the NCAA’s role in all of it. Mechelle and Michelle pick the best players & coaches of the year. Princeton (27-0), which is the last undefeated team in Division I women’s basketball can also surpass the Penn men’s team of 1970-71 that won its first 28 games to set the league record for best start to a season. That team made it to the regional final and was ranked as high as third in the poll. “It’s going to be a busy five days but we’re ready for it,” Banghart said. Seeing Kacy Swain power up and down the court, yelling to her teammates, clawing for rebounds, or driving for a layup, someone who does not know her story would not realize that her physical burden goes beyond the sweat beading down her forehead and the weight of exhausted legs still trudging deep into the second half. Swain, a redshirt junior forward on the women’s basketball team, is back to playing every day after missing all of last season with a torn right ACL. Knee healthy, Kacy Swain has not been timid around the glass and gained more playing time as the season progressed, establishing herself as someone who coach Cori Close considers to be integral to the team. Fifield is a member of the Maine Sports Hall of Fame and the New England Basketball Hall of Fame. He was named the Russell Athletic/WBCA Division III National Coach of the Year in 2005. Our upbringing as two sibling-future WNBA No. 1 draft picks was about as unconventional as it gets. There were no epic one-on-one battles for sibling supremacy or bragging rights. Instead, our connection through basketball began with us wearing embroidered jorts to a YMCA league when we were 10 and 11 years old. We got in there and these girls are doing two-ball dribbling drills. We didn’t know how to handle a basketball at all. I got embarrassed and ran into the bathroom. I stayed there the entire time. Nneka toughed it out and finished the practice. She’s the protective one. She tries a lot of things — I call her the guinea pig of the family. As we got better and developed our skills in that league, there was always the question from our teammates: Who’s better? When are you guys gonna play each other? Quentin Hillsman said recruiting has gotten harder since he became the head coach at Syracuse. He used to tell recruits they would get playing time to persuade them to join the Orange. But as his team improved, he could no longer make those guarantees. Enter Kelley Gibson, a former WNBA champion.